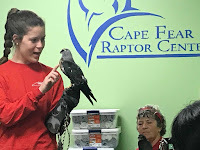 University of Maryland Alternative Spring Break Program: Follow our week in Topsail, NC as we volunteer with multiple community partners, such as the Karen Beasley Sea Turtle Rescue and Rehabilitation Center. Throughout the week, we will be learning about our impact on the environment around us and how we can reduce this impact. The final day of our trip was such an emotional roller coaster. Today was the day a lot of us have been looking forward to: Teaching Day! We spent this morning awaiting the arrival of 550 students ranging in age from kindergarten through high school who all came to learn about the sea turtle hospital. 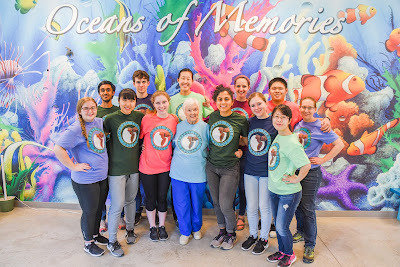 Some of us were placed at the teaching stations in the hospital where the students could learn about the different sea turtle species, sea turtle anatomy, cold stunning, nesting, threats to sea turtles, and surgery success stories from the hospital. The students were also able to peer into sick bay and walk through sea turtle bay where the rest of us were stationed to tell the stories of the individual sea turtles. It was fun to watch their excitement as we introduced them to the turtles. This morning we were off bright and early again to the turtle hospital. Leaving the house at 7:15 am has been getting easier, but no one seems all that excited to be up early. However, we've been able to see the sunrise each morning during breakfast. 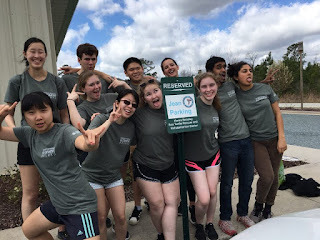 We again split into two teams--four people worked with the turtles in Sick Bay and the rest of the group worked with the turtles in Turtle Bay. We got to work again with the volunteer team leader, Gail who was excited to see us and get us to work. We fed the turtles their food and medicine at 8am, going making sure that none of the food got sucked up by the filtration system. The green turtles had special filters we attached to their take intake pipes to prevent their vegetables from being sucked up by the filtration system. As before, we then left the turtles to digest and dirty their tanks while we worked to sweep and mop the turtle center. Deep Down, We Are All Essentially Turtles. Day 3 started very gloomily with the skies being dark and cloudly. We left the house at 7:15 A.M. as it was pouring down rain. However, when we arrived at the Turtle Hospital, we immediately felt our day brighten up! The volunteers were welcoming as always, although unfortunately the turtles seemed agitated by the incoming thunderstorms. Day 2!!! Very excite!! We woke up extra early to arrive at the turtle hospital at 7:30am, as per request by Jean. With morale high (and eyelids a little heavy), we got ready to experience another wonderful day helping all the sea turtles. Luckily, today was a lot warmer than the previous two days, which definitely helped to wake some people up. Terps Helping Turtles is a go! The team got on the road around 8:30am yesterday and began our journey stocked to the teeth with snacks. Nelson and Sabrina took the wheel(s) for the first leg of the trip, and the cars jammed out to everything from K-pop to classical. Conversation topics ranged from arguments over the moral existence of altruism to a debate over whether 2000s music would be classified in the "oldies" genre.